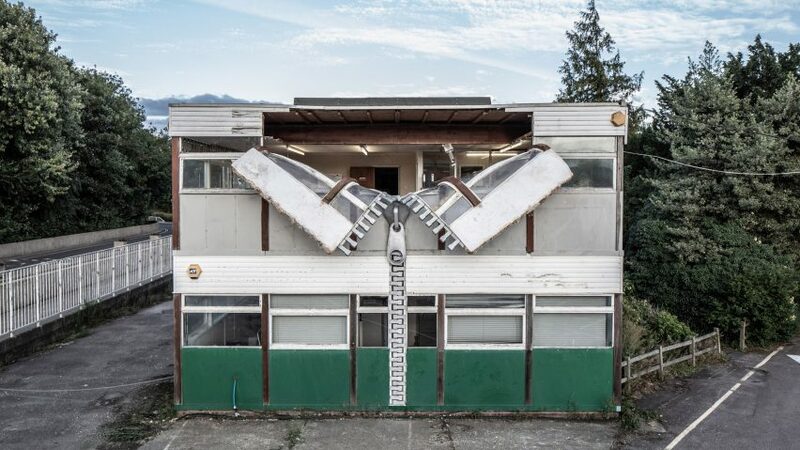 The walls of a soon-to-be-demolished office building in Kent, England, appear to have been zipped open in this installation by artist Alex Chinneck. 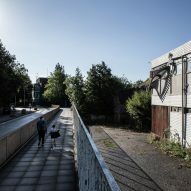 Called Open to the Public, the eight-metre artwork is located at a former tannery near to Chinneck's new studio in Ashford, which is currently empty and facing demolition. 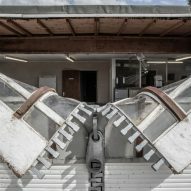 It consists of an enormous double zip, which appears to be opening up the the front of the 1960s-style building, and a similar single zip that runs along the side. 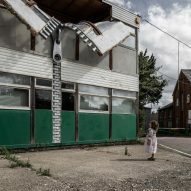 Both zips appear to bend the walls of the building, to reveal a derelict interior. 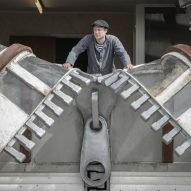 The artist is known for his surrealist projects that merge art with architecture and engineering. 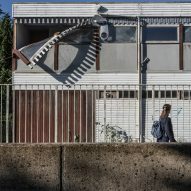 He has previously created a huge rip in a London building and transformed a Margate house to make it look like the facade was sliding off. 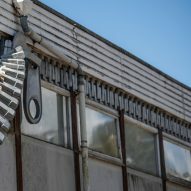 This latest installation references the history of the office building, as the home of a leather and textile manufacturer, but also alludes to its imminent demolishment. 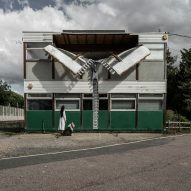 Chinneck describes it as "theatrical and surreal". "There is a history of textile that fed into the language of the zip," he told Dezeen. 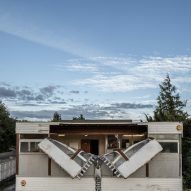 "The building presented a good opportunity because, facing demolition, it gave us sculptural freedom to open it up to the elements." "When introducing a narrative, we take complex paths to get to simple moments, which are quite accessible and conceptually light – we kept it playful with the zipping element," he added. Chinneck conceived and produced the project over a period of two months. 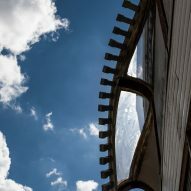 He doesn't want to reveal the exact details of how the new facade was made – but he said that he used a composite of rubber and other flexible materials. The structure was installed onto the front of the building in one night. It opens to the public tomorrow, 2 August. Chinneck, a member of the Royal British Society of Sculptors, was based in Hackney before relocating to Kent. 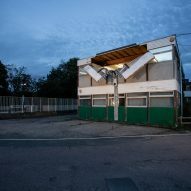 His other large-scale installations include a parked car upended on a tarmac wave and a 35-metre-tall, upside-down electricity pylon. 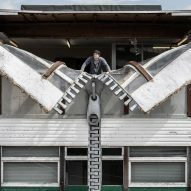 "I design playful public artworks for everyone to experience and enjoy, turning the every day into the extraordinary," he concluded.